Super CAS style card Lisa and a pretty lilac bow complements the little elephants perfectly. I love those adorable elephants and those shades of lavender! So glad you joined Cupcake Inspirations 200th Challenge celebration! Good luck! 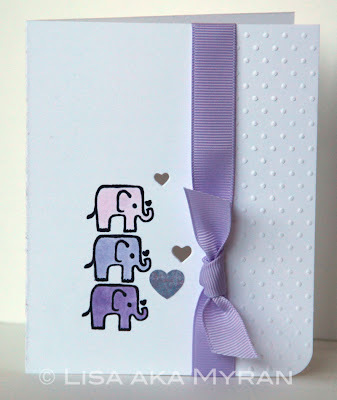 Gorgeous CAS card Lisa, super cute elephants and the lilac really "pops"
Nydelig♥. Takk for at du deltar på utfordringen til MAWTT denne uken og lykke til♥. Awww - this is so sweet. love the lil hearts and the darling elephants. Is that from Amy Tangerine?